I have switched to blogging at the Systems Biology Ireland blog. 2 + 4 = 6 , 4 + 2 = 7? This entry was posted in Blog on 22 March 2017 by colm. In Defense of a PhD in Yeast Genetics 2 – Why Genetic Interactions? Okay – hopefully the last post goes some of the way towards answering the question of why we study yeast. Here I’ll try to explain why we study genetic interactions in yeast, the research area I worked on during my PhD . This post will be longer and more detailed than the last, but hopefully no more difficult to follow. If you get lost, please comment. Genotype to phenotype – some context! First off, some context. A central problem in genetics is to understand the connection between genotype and phenotype, i.e. how variations in DNA (genotype) result in changes to specific observable characteristics (phenotypes). From a medical genetics point of view we may wish to identify the genetic variants that predispose us to specific diseases, while those involved in agriculture may wish to identify variants that make crops more resistant to drought. When such variants are found by geneticists, they are typically reported in the news in the form “Scientists find the gene for X“. In reality things are rarely that simple, because genes and their protein products do not act individually. Many genes work together to carry out specific tasks – for example there is no one gene responsible for ensuring that your DNA gets replicated accurately when your cells divide. Rather, a whole host of genes work in tandem to ensure this process goes smoothly. This is also true of many diseases – many distinct variants can increase your likelihood of getting cancer or diabetes. Perhaps even more surprising than this (that mutations in many different genes result in the same apparent outcome) is that some outcomes are only visible in the presence of combinations of mutations. Such phenomena, where combinations of mutations result in different outcomes than what one would expect based on the outcome of each mutation in isolation, are generally referred to as genetic interactions. Understanding genetic interactions is an important challenge for a number of reasons. One is that they are believed to be responsible for some of the ‘missing heritability’ of complex diseases. In such instances we can see that a disease appears to be heritable (i.e. it runs in families) but a single variant cannot adequately explain the patterns of inheritance. In these diseases it may be the case that specific combinations of mutations are more important than any individual mutations. Another reason is to understand genetic robustness. It may surprise you that most of us carry a large number of ‘broken’ genes, i.e. genes that appear mutated in such a way that they cannot function properly. How do we survive with these broken genes? One reason is because of a property of biological systems called robustness. Genetic interactions are key to such robustness – if there is a problem with gene A, then maybe gene B can cover for it, and vice versa. We may then only observe a problem if both gene A and gene B are mutated simultaneously. So understanding genetic interactions may be a key part of understanding susceptibility to complex disease and also understanding the robustness of biological systems. Why study genetic interactions experimentally? A more direct way to explore genetic interactions is to experimentally introduce mutations into a well defined genetic background. This can be done using isogenic populations of organisms – effectively populations of clones that have identical DNA. We can then see the impact of introducing mutation A on its own, mutation B on its own, and then mutation A and B together, while keeping all other genes the same. This is more or less what is done in yeast genetic interaction screens – two genes are mutated in a single yeast strain and the impact that this has on a phenotype (typically the growth of a colony) is then measured. This can result in surprising findings – sometimes it is possible to independently mutate gene A or gene B with little consequence for growth, but mutating both simultaneously results in cell death! This suggests that genes A and B might perform the same essential function – mutating gene A leaves gene B to carry out the function, mutating gene B leaves gene A to carry out the function, but mutating gene A and B together means there’s no gene to carry out the function and consequently the cells do not survive. Why study genetic interactions in yeast? For the reasons I mentioned in my previous post! Yeast are easy to grow and very easy to manipulate genetically. About 15 years ago, researchers at the University of Toronto developed a technique to create large numbers of double-mutants (organisms with two genes mutated) in yeast. This approach allowed us to move from identifying individual interactions (genes A and B cause cell death when mutated together) to large networks of interactions involving hundreds of different genes (gene A causes cell death when mutated together with genes B, C, D…). This technique was improved and refined over the next decade by a number of different labs and now we have over 6 million gene pairs tested for interaction in yeast and will likely have all possible pairs (~18 million) tested in the not too distant future. We are nowhere near this stage with any other organism. Only in the last few years have we started to see analogous approaches developed in mammalian cell systems. These approaches have been used to create ‘proof-of-concept’ interaction networks in human cells and mice cells. These networks are still significantly smaller than those created in yeast a decade ago (<5,000 gene pairs) and have benefitted enormously from the computational tools and experimental designs perfected in yeast in the intervening years. As I mentioned in the previous post – yeast are a proving ground for new technologies! So what do we actually learn from genetic interaction networks in yeast? In my last post I mentioned two (of many) distinct reasons that geneticists study yeast – gaining insight into specific genes and processes and understanding general principles of biological systems. Large scale genetic interaction experiments (usually called screens) in yeast have delivered in spades on both fronts. A few different labs have focussed on creating comprehensive networks for specific biological processes – for example testing for genetic interactions between every pair of genes known or suspected to be involved in DNA replication. This approach allows us to build up a comprehensive picture of a particular biological process – identifying which genes work together and depend on each other, effectively creating a functional ‘wiring’ map of that process. In addition these experiments have also led to the characterisation of genes previously unknown to be involved in specific processes, i.e. we did not know what function a particular gene carried out but thanks to genetic interaction screens we do! At a more abstract level we have learned about the general principles underlying genetic interaction networks. For example we have found that two genes involved in the same process are significantly more likely to interact than genes involved in different processes – e.g. two genes involved in DNA replication are more significantly likely to interact than one gene involved in DNA replication and one gene involved in building the cell wall. Moreover we have found that some genes tend to have significantly more genetic interactions then others, and that this is true of specific types of genes. Both of these latter observations have the potential to inform the search for genetic interactions in cancer a topic I will discuss in my next and final post in this series. This entry was posted in Blog on 22 July 2015 by colm. In November 2012 I had my PhD viva – a defence to other academics of the work I had carried out over the previous four years. The primary goal of the viva is to establish that the student has made a valuable and original contribution to his chosen field of research. Fortunately my thesis was considered sufficiently valuable and original that I passed. Below is a defence to a different, wider, audience – the Irish public, who were responsible for funding me during the course of my PhD. Given the ongoing public discourse on the value of basic science in Ireland, I felt this was worth writing up. When I tell people I meet that I work in genetics, they usually respond very enthusiastically. They may bring up some genetics story they have read in the news – such as the high prevalence of cystic-fibrosis in Ireland, the Angelina Jolie BRCA story, or the fact that many of us are apparently part-neanderthal. It really is a pleasure to work in a field that the general public has a real interest in. That said, when I mention that I study yeast genetics, the reaction changes somewhat. It seems like such an arbitrary and obscure research topic, the sort that could only survive in academia. Given that for my PhD I was funded by the Irish taxpayer, it also seems to many like money that could be better spent elsewhere. Why study a fungus when there’s cancer to be cured? I’ll try and address this here – outlining some of the reasons why geneticists study yeast, and also why I believe my specific research area is of value. Perhaps the most important thing to know about yeast is that, like us, they are Eukaryotes. This means it has a nucleus, a little compartment inside every yeast cell that houses its DNA. In fact yeast are remarkably similar to us in a lot of ways. Yeast cells have to carry out many of the same tasks that human cells do – they have to replicate DNA, they have to turn DNA into proteins, and they have to direct molecules around inside their cells. Many yeast genes have counterparts (orthologs) in humans, and these counterparts often carry out the same function in both species. So discovering what functionality a yeast gene is responsible for often gives insight into the functionality of the human counterpart. This observation has resulted in a number of Nobel Prizes in Medicine for yeast geneticists. 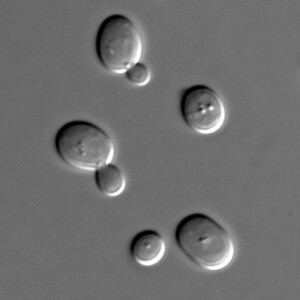 For instance – Paul Nurse and Lee Hartwell discovered a number of genes that control cell division in yeast. Cell division is a vital part of life – it’s how we go from sperm and egg to full human being – and is also a process that is dysregulated in cancer. The genes that Nurse and Hartwell discovered in yeast have counterparts in humans that appear to function in the same way. Similarly, Randy Schekman shared a Nobel Prize in 2013 for his work identifying genes responsible for vesicle trafficking in yeast. Inside all Eukaryotic cells there are a number of different compartments, such as the aforementioned nucleus. This compartmentalisation has lots of advantages, including ensuring that harmful molecules are not free to bounce around the cell. However, it creates a need for a trafficking system to allow different molecules to be moved from compartment to compartment when required by the cell. Schekman focussed on understanding this system in yeast, identifying a number of genes involved in the trafficking process. Another scientist, James Rothman, later studied the same system in mammalian cells and found that many of the yeast genes identified by Schekman had functionally similar human counterparts. Finally, the third scientist to share the 2013 prize, Thomas Südhof, worked on mammalian nerve cells to identify how the trafficking machinery identified by Schekman and Rothman ensured that molecules were delivered to the right place at just the right time, a critical part of how nerve cells communicate in the brain. So yeast can provide insight into topics important for human health ranging from cell division and cancer, to signalling in the brain. Thus one reason to study yeast is to get a better understanding of specific genes and processes – which genes are responsible for specific tasks (e.g. controlling the cell cycle, controlling trafficking) and what a specific gene of interest does. But that doesn’t really answer the question of why we should study yeast in particular, instead of other organisms. Why not study humans and our cells directly? The short answer is because it’s much much easier to study yeast! It’s very easy to grow in the lab and it’s very easy to manipulate genetically. The latter is especially important for genetics – it’s far easier to manipulate a specific yeast gene and see what happens, than it is to manipulate its human counterpart. Also important is yeast’s relative simplicity – the most widely studied yeast has ~6,000 genes vs ~20,000 in humans and as it is a single-celled organism it does not have the added complexity of multiple cell types like us (kidney, liver etc). For these reasons yeast is something of a proving ground for new technologies – typically new molecular biology and genetic approaches are applied to yeast long before they are applied to humans (e.g. we had a yeast genome before a human genome). The ease of growth and genetic manipulation, combined with its relative simplicity, make yeast an excellent tool for understanding general features of biological systems. Compared to identifying the functions of specific genes this is a more abstract but equally important goal. To explain what I mean by understanding general features of biological systems it’s probably easiest to give an example. Cells, of all varieties, need to respond to stimuli. This response typically involves increasing the production of specific proteins, often hundreds at a time, in a coordinated fashion. The process by which this happens involves complex ‘regulatory’ networks, which regulate the production of proteins at specific times and under specific conditions. In humans, because we have multiple different cell types and many more genes than yeast, these networks are significantly more complex than in yeast. By studying and mapping these networks in yeast, we can hope to learn principles that may be broadly used in all species, e.g. what patterns are used to ensure that hundreds of genes are ‘turned on’ at just the right time? I have highlighted two reasons to study yeast : 1) it provides insight into specific genes and processes and 2) it allows us to explore general features of biological systems. There are many more reasons – it helps us make beer and bread – but even if all we are interested in is the relatively narrow field of human health, yeast can provide us an enormous amount of knowledge that we could either not get any other way, or would take us far longer to get using other systems. In my next post I’ll discuss the merits of studying genetic interactions, my particular area of research. This entry was posted in Blog on 4 March 2014 by colm.